Two new Android apps have been launched by ING DIRECT USA. The Android apps add to ING DIRECT’s suite of banking and investing iPhone and Blackberry apps and Android ATM locator app, which were launched earlier this year. + Transfer money: Between flights? No problem. ING DIRECT USA Mobile makes transferring money between your Electric OrangeSM Checking, Orange Savings AccountSM and linked external checking accounts a breeze. + Pay bills on the fly: You’ll never have to worry about forgetting to pay that bill again. ING DIRECT USA Mobile lets Customers manage the same Bill Pay preferences they have set up through ingdirect.com. + Pay people: ING DIRECT USA Mobile lets you pay friends back for the tab before dinner’s even over. Customers can quickly and easily send money to existing contacts in their Person2Person address book. + Check balances: On the move and need a quick snapshot of your accounts? You got it. ING DIRECT USA Mobile securely displays all of the Customer’s accounts and account details like account number, balance, and transaction summary and details. + Flip for fun: With a quick flip of your Android device get social and check out what Savers have to say with one touch access to ING DIRECT’s social media efforts, including Twitter, Facebook, We, the Savers, and YouTube. + Mobile Access. In the office, at the airport or on the beach, ShareBuilder Mobile gives investors fast, safe and secure access to their account balances and the ability to easily view their account positions. + Mobile Money Transfers. ShareBuilder Mobile lets investors safely and securely move money to and from their account and check the status of their transfers at any time. + Mobile Trading. With ShareBuilder Mobile, investors won’t have to miss another trading opportunity. ShareBuilder Mobile lets investors buy and sell stocks and Exchange Traded Funds (ETFs) and place market, limit and stop-loss orders. + Mobile Market News. ShareBuilder Mobile lets investors move to the beat of the market with access to the latest market news, stock quotes and charts for the day’s market movers. + Mobile Watch Lists. Investors can follow their favorite stocks with ShareBuilder Mobile by creating and managing watch lists on the go. More information is available at http://ingdirect.com/mobile and http://sharebuilder.com/mobile. The apps are available for download by visiting the Android Market. 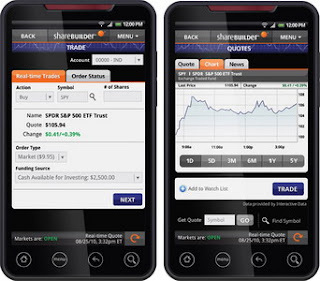 0 comments on "ING DIRECT USA launches Android mobile banking and ShareBuilder mobile investing applications"